If you are looking for homemade Christmas decorations that your kids can make these lanterns fit the bill. They take minutes to make and dry, and look absolutely wonderful on a mantlepiece or table. Clear (preferably recycled) glass jars (e.g. old baby food jars/jam jars etc). 1. 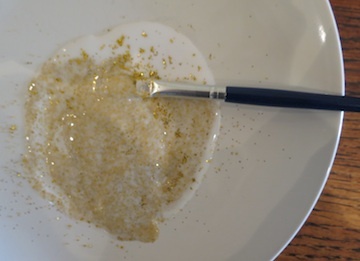 Mix a good squeeze of PVA glue onto a plate and tip in some glitter. (You will need quite a lot of glitter, we used half a tube for one lantern!) Mix. 2. Using a paintbrush paint the glitter mix onto the jars. We did stripes on one of them. Leave to dry. 3. Place a tea light or small candle into the jar and light (adults only). Hey presto! - one of our easiest Christmas kids crafts! Ps: Don't forget to blow out candles when you leave the room! 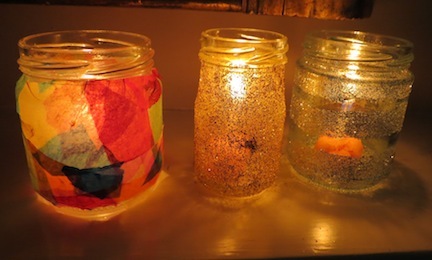 Tip: You can make the glitter on these lanterns stick well by washing the lantern once the glue is fully dried. This takes off any excess glitter and leaves the lantern smooth and shiny on the outside. 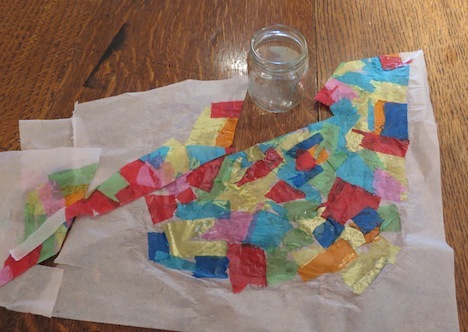 However, if you are one of those who can't stand any glitter in the house try out another one of our simple christmas crafts below and make colourful lanterns! Of all the easy Christmas crafts you can make this is one easiest and prettiest. 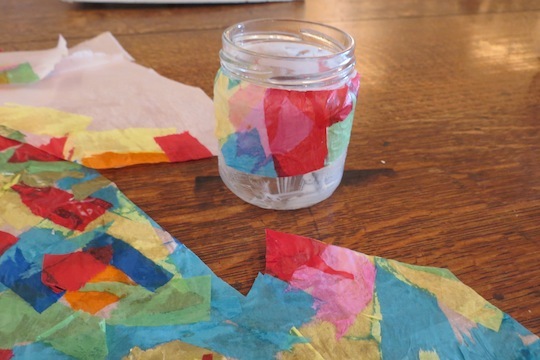 It uses left over materials from the preschool stain-glass craft and small recycled glass jars to make little wintery lanterns for your mantlepiece, windowsill or table. Truly one of the best recycled Christmas crafts! 1. Take the leftover "stain-glass" from previous craft and cut it into short, thick strips. 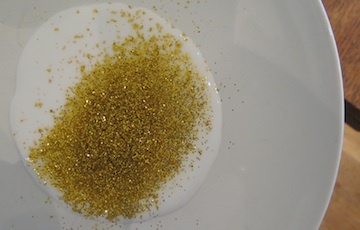 Click here to see how to make this. 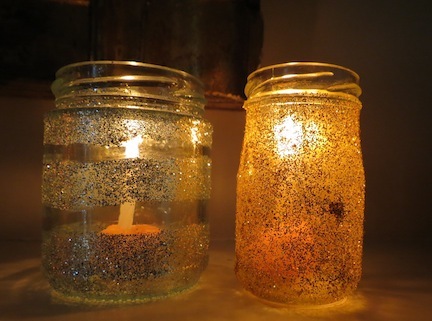 Take a clean recycled glass jar and cover the sides in PVA (no need to do the bottom). 2. 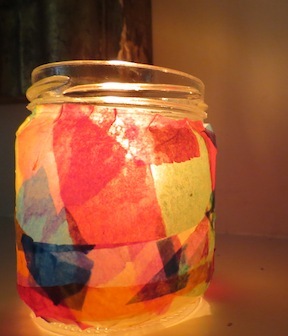 Stick the strips of "stain-glass" around the jar, using as much glue as needed to stick it firmly down. You don't want stray bits of paper on the glass. 3. Once dry put a tea-light or small candle (adults only to light this) in the jar and enjoy the colourful flickering lights on a winters night! Again, don't forget to blow out candles when you leave the room!